Sirix is a temporal database system and never overwrites data. Let’s first define what a temporal database system is all about. A temporal database is capable of retrieving past states of your data. Typically it stores transaction time, that is the time a transaction commits data. If we also store the valid time, that is when a fact is true in the real world we model we have a bitempiral relation, that is two time axis. Questions such as the following might be easily answered: Give me last month’s history of the Dollar-Pound Euro exchange rate. What was the customers address on July 12th in 2015 as it was recorded back in the day? Did they move or did we correct an error? Did we have errors in the database, which were corrected later on? The switch to flash drives keenly motivates to shift from the “current state” paradigm towards remembering the evolutionary steps leading to this state. The main insight is that flash drives as for instance SSDs, which are common nowadays have zero seek time while not being able to do in-place modifications of the data. Flash drives are organized into pages and blocks. Due to their characteristics they are able to read data on a fine-granular page-level, but can only erase data at the coarser block-level. Furthermore, blocks first have to be erased, before they can be updated. Thus, updated data is written to another place. A garbage collector marks the data, which has been rewritten to the new place as erased at the previous block location, such that new data can be stored in the future. Index-structures to find the data at the new location are updated. Instead, from a storage point of view it is desirable to only store the changes. As we’ll see it boils down to a trade off between read- and write-performance, that is having to reconstruct a page in-memory from scattered incremental changes or having to store more records than necessarily changed. Sirix stores per revision and per page-deltas. Due to zero seek time of flash drives we do not have to cluster data. Sirix only ever clusters data during transaction commits. It is based on an append-only storage. Data is never modified in-place. Instead, database pages are copied to memory, updated and synced to a file in batches by means of a post-order traversal of the internal tree-structure once a transaction commits. The UberPage is the main entry point. It contains header information about the configuration of the resource as well as a reference to an IndirectPage. The reference contains the offset of the IndirectPage in the data-file or the transaction-intent log and an in-memory pointer. An uber page is always written as the last page during a transcation-commit. Thus, even in case the transaction fails, we always have a valid, consistent state of the storage. IndirectPages are used to increase the fanout of the tree and in essence to be able to store and retrieve a large number of records (while only ever having to read a predefined number of pages once a record has to be read again). We currently store 512 references in the IndirectPage to either another layer of indirect pages or the data pages, either a RevisionRootPage or a RecordPage. A new level of indirect pages is added whenever we run out of the number of records we can store in the leaf pages (either revisions or records), which are referenced by the IndirectPages. The height of the current subtree, that is the number of levels of indirect pages is always stored in the respective subtree-root page. We borrowed the ideas from the filesystem ZFS and hash-array based tries as we also store checksums in parent database-pages/page-fragments, which in turn form a self-validating merkle-tree. As IndirectPages potentially may have many null-pointers we use a bitset to keep track of which array indices are really set and thus are able to store a compact array or list in-memory. The RevisionRootPage is the main entry point to a revision. It stores the author-ID, an optional commit-message and a timestamp in the form of the unix epoch (milliseconds since 1970). Furthermore it stores a reference to a PathPage, a CASPage (if it exists), a NamePage and an IndirectPage. The indirect page is the entry point to the data stored in the leaf RecordPages. The right subtree of the RevisionRootPage started by the IndirectPage actually is the main entry point to our data stored in the leaf nodes, the RecordPages once again. To support fast access to a RevisionRootPage we store a second file with just the offsets to specific revisions in a revisions-file, which is read into main-memory on startup. 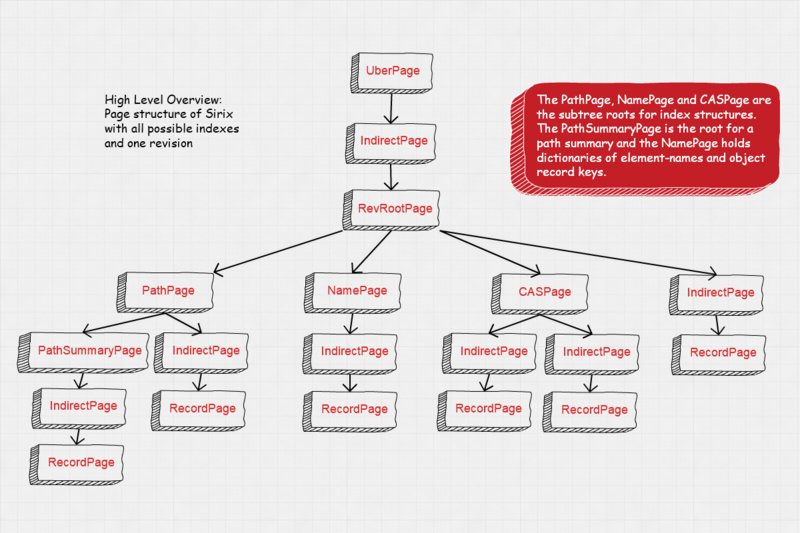 The PathPage has references to IndirectPages, whereas each of the indirect pages is the root entry point to a user defined path index. A unique index ID is also the reference offset in the path page to retrieve the according path index / IndirectPage subtree root. References to indirect pages are added, once path indexes are created. In the leaf pages (the RecordPages), which are referenced by the indirect pages, an AVL-tree is stored for each individual index. The index contains path nodes as keys as well as an array of record-identifiers in the values. Furthermore a path page contains a reference to a PathSummary page. A path summary page has a reference to an indirect page which is the main entry point to retrieve and restore a lightweight path summary in the leafs of the tree, the RecordPages. In this case the data / record pages store the path nodes. The NamePage contains dictionaries of frequently used names (element-names/attribute-names and namespaces in XML or object key names in JSON), which are referenced from the records. Furthermore IndirectPages are created once user-defined name-indexes are created, whereas each indirect page is the root of an index (just as described for the path page the indexes are stored in the leaf record pages in AVL-trees). A CASPage is the main entry point to store and retrieve CAS- (content-and-structure) indexes. They are a hybrid consisting of path class definitions and typed content. /book/published[xs:dateTime] for instance indexes the path /book/published and the content as xs:dateTime. The indexes are as always stored in AVL-trees. RecordPages store the actual data. Currently we store 512 records in a record page. Each record page also has a pointer to the previous record page, which stores the offset of the previous version of this record page. This is crucial for our versioning algorithms, which have to retrieve several record pages (or record page fragments) in order to reconstruct a record page in-memory. Furthermore, records, which exceed a predefined size are stored in so called OverflowPages and referenced in a record page. OverflowPages are used to store records, which exceeds a predefined size in bytes. As record pages have to be read into memory and potentially only a small fraction of records in the page have to be retrieved and reconstructed from byte-arrays in-memory we’re able to delay this reconstruction until the overlong record really has to be fetched by our storage engine. The next figure depicts what happens during a transaction-commit. We assume that we have inserted/updated/deleted a record in the leftmost RecordPage. Depending on the versioning algorithm the modified record as well as probably some other records of the page are copied to a new page fragment. First, all changes are stored in an in-memory transaction (intent) log, which can be persisted, if needed. Second, during a transaction commit the page-structure of the current RevisionRootPage is serialized in a postorder traversal. All changed RecordPages are written to disk / a flash drive, starting with the left most. If other changed record pages exist underneath an indirect page, these are serialized before the IndirectPage, which points to the updated record pages. Then the IndirectPage which points to the updated revision root page is written. The indirect pages are written with updated references to the new persistent locations of the record pages. We also store checksums in the parent pointers as in ZFS, such that the storage in the future is able to detect data corruption and heal itself, once we partition and especially replicate the data. The whole page-structure is serialized in this manner. We also want to store an encryption key in the references in the future, to support encryption at rest. Note, that we have to update the ancestor path of each changed RecordPage. 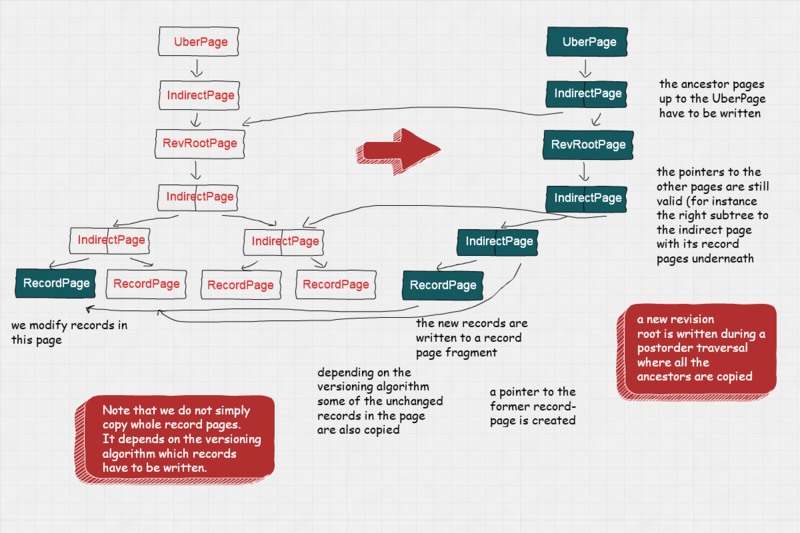 However, storing indirect pages as well as the RevisionRootPage/CASPage,PathSummaryPage and the PathPage is cheap. We currently store copies of the NamePages, but in the future might also version these according to the chosen versioning algorithm, just like RecordPages, such that we do not need to copy the whole dictionaries and save storage costs thereof. Each reference, which doesn’t point to a new page or page-fragment is left unchanged. Thus, unchanged pages (which are also not on the ancestor-path of changed pages) are simply referenced at their respective position in the former revision and never rewritten. One of the dictinctive features of Sirix is that we are versioning the RecordPages and not just copy all records in the page, even if only a single record has been modified. The new record page fragment always contains a reference to the former version. Thus, our versioning algorithms are able to dereference a fixed predefined number of page-fragments at max to reconstruct a RecordPage in-memory. We currently support one read/write-transaction concurrent to N-read only transactions. Thus, our architecture supports concurrency very well (note the difference between concurrency and parallel computations, the former simply is a prerequisite for the latter). If we ever want to allow concurrent writes to the same resource we could introduce a form of serializable snapshot isolation (which we think is not feasable for tree-structured data as XML- and JSON, at least if we store hashes of the nodes and the number of descendants).